2 Queens - A blessing or a curse? How far ahead can you calculate? If you haven't already caught this, Chinese players Wang Yue and Li Chao were eliminated from the 2009 FIDE World Cup after turning up late for their playoff games in the third round. The reason for the lateness was that they were outside the playing hall having a smoke. Alerted that their games were about to start, both players rushed inside, but it was too late, and the games were declared loss. The most astonishing thing about this (apart from the obvious problems with 0 minute forfeit times) was that Li Chao didn't even smoke before the tournament, and only took it up to join Wang Yue's 'smoking group'. Chessvibes have coverage and comment here, while there is an interview with the 2 players here. Former Australian Junior Champion Junta Ikeda successfully defended his Vikings Weekender title, winning the 2009 event with a perfect 6/6. The two crucial games were is win in round 5 over second seed FM Endre Ambrus, and final round win over 3rd seed Andrew Brown. In both games Ikeda was often below 10 seconds on the clock (the time limit was 60m+10 sec increment), but managed to not only hold poor positions, but convert them into wins. Second place was shared between Ambrus, and weekend circuit regular Trent Parker. Both finished on 5/6 with Parker defeating the higher rated Milan Grcic in the final round to grab $250 in prize money. Full tournament results can be found here. The 2009 Vikings Weekender has got off to a good start, with a field of 57 players fronting up. It is a little weaker than last year but the field once again contains the usual mix of under-rated juniors, veteran Canberra players, and a small group of interstate visitors. As the tournament is one big swiss (rather than broken into sections) the day ended with 6 players on perfect scores. Junta Ikeda, Andre Ambrus, Allan Setiabudi, Arthur Huynh, Ian Rout and Andrey Bliznyuk all scored 3 wins. Given the number of players at the top it may not be until the final round that a clear leader will emerge. One player who is hoping that the leaders knock themselves out is 3rd seed Andrew Brown, who drew with Nick Beare in the 1st round. Brown had R+N v R+B+P but the confined nature of Beare's king meant there were a few tricks to watch out for. And while Brown tried most of them, when it became clear that the only one left was to hope for a win on time, Brown instead offered a draw, which Beare happily accepted. Full results for Day 1 of the tournament can be found at Ian Rout's website. 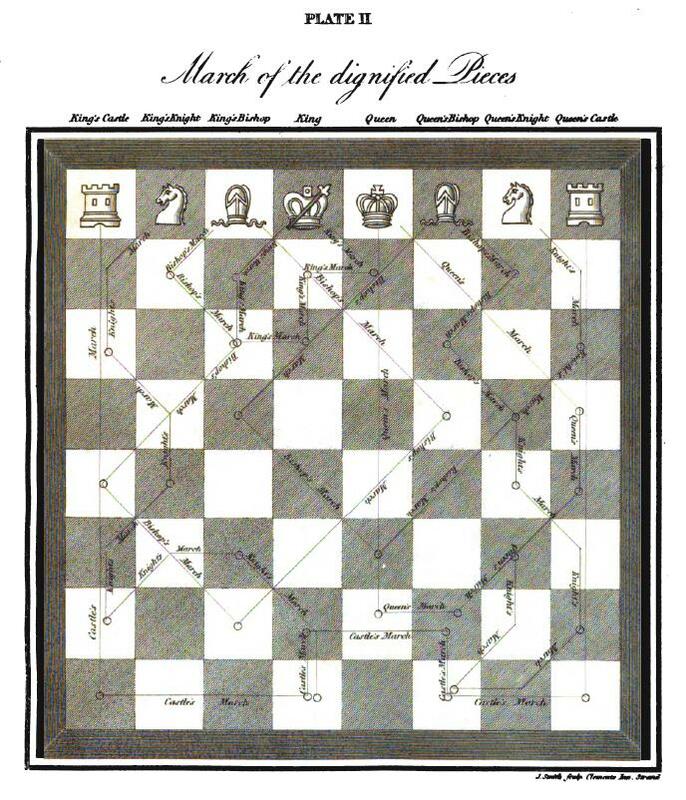 While "March of the Dignified Pieces" sounds like something by Saint-Saens, it is instead the description of the diagram to the right. 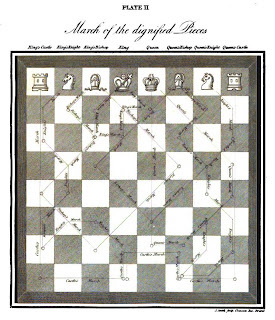 It comes from the 1823 book "Practical Chess Grammar: or, An Introduction to the Royal Game of Chess: In a series of plates." There is a famous story attributed to Korchnoi concerning an Olympiad game. Playing a weak opponent he is soon up a piece. The game progresses and soon he has won another piece. Suddenly he says to his opponent "Do you speak English?" "Yes" says his opponent. "Then why don't you resign?" growls Korchnoi. While I'm not sure how true the story is, it is always tempting to demand that of an opponent, especially when you are clearly winning. However on some opponents such a comment would be clearly wasted, as they clearly believe that "no one ever won a game by resigning"
One player who this applies to is English IM Michael Basman. 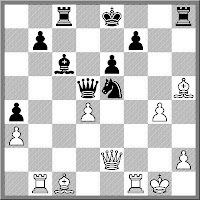 David Levy gives a selection of Basman "swindles" in his book "Play Chess Combinations and Sacrifices", swindles that generally kick off long after 'decent' players would have stopped the clocks. However one swindle he declined to publish was a particularly painful loss he had to Basman, where Basman sacrificed a queen in an inferior position. The sac wasn't that helpful, as Levy's advantage actually increased but eventually the succession of short term threats all got to much for Levy who blundered and lost, 18 moves later! Australian Junior Bobby Cheng has become the World Under 12 Champion, finishing outright first in his division in the World Youth Chess Championships in Turkey. Cheng secured the victory with a win over the tournament top seed in the final round. Although representing Australia, Cheng started his chess career in New Zealand, a point not missed by their media. Almost as good was in the Under 8 Championship where Anton Smirnov finished in a tie for second place, although he missed a medal on countback. Of the Canberra juniors who played, Yi Yuan scored 7/11 in the Under 14's, Emma Guo scored 6 in the Under 14 Girls, while in the Under 18 Girls Tamzin Oliver scored 4.5 and Alana Chibnall scored 4. 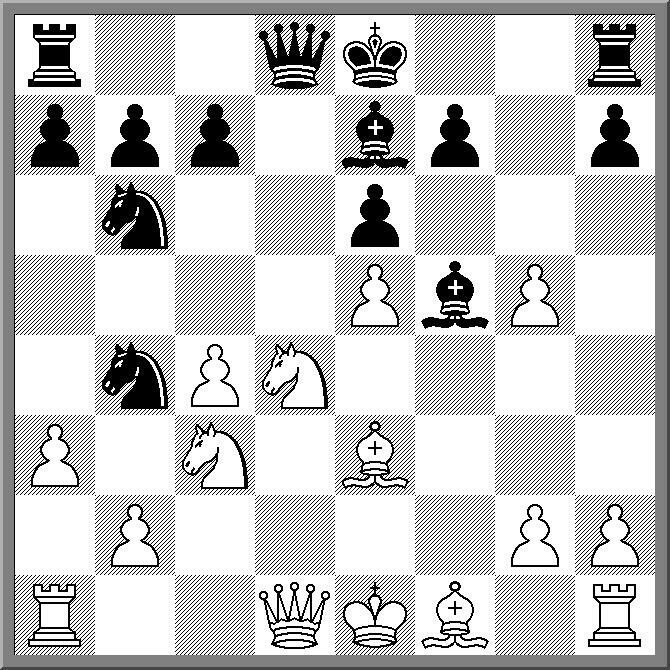 Canberra GM David Smerdon got off to a promising start, drawing with GM Leinier Dominguez in the first game of the 2009 FIDE World Cup KO. Despite being outrated by almost 200 points, and starting with Black, Smerdon was better for most of the game, before the position was repeated. This gives Smerdon a chance to wrap up the 2 game match with a win tonight. Smerdon's chances of an upset victory are improved by the fact he has White in tonights game. As I write this, Dominguez v Smerdon Game 2 has reached an equal position after 21 moves, which means that the match may go to a playoff tomorrow. I finally got to see "The Avengers" movie tonight (on Satellite TV). Apparently it got savaged by the critics when it first came out, although this maybe because it didn't get the transfer from the TV series 'quite right'. It did however contain a slight variation on the ' is clearly smart as they can play chess' trope. Uma Thurman's character (Emma Peel) was playing a game of chess against Ralph Fiennes character (John Steed). While he was moving the pieces on the board she was busy doing something else and simply shouted out her replies, essentially playing blindfold. This idea was also used in 'Searching for Bobby Fischer' and is clearly intended to show that the character isn't just smart, but 'really, really, smart'. The scene also contained two interesting 'artefacts'. One, they were using English descriptive (Queen to Rook Five), although the movie seems to be set in the 1990's (when it was made). 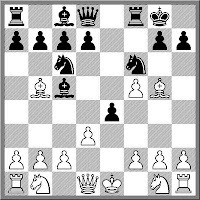 Two, the director utilised the hoary old chestnut where a check from Steed (Knight to king seven check) was met by a checkmate from Peel (Queens takes knight, checkmate). However I may be mistaken about the second one, as my attention did wander at times. Play in the 2009 FIDE World Cup kicks off tomorrow. This evening sees the opening ceremony, with the first game of Round 1 starting at 15:00 Khanty-Mansiysk time ( or 21:00 Canberra Time). The Oceania representative is GM David Smerdon, who is seeded 114th out of 128 players. In the first round his opponent is Cuban GM Leinier Dominguez Perez. As with the first round of chess events I am never sure how well the live coverage will operate, but here is the official site, so you can have a look tomorrow evening. 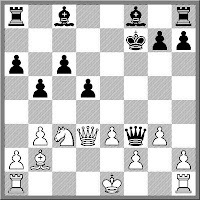 White to move in the following position. A second queen is about to appear on the board, but Black is counting on the perpetual check to halve the point. So White played 1.c8(Q) and Black duly played Qe1+ followed by Qe5+ and the game ended in draw. It was only in the post mortem that spectators pointed out that White could have played ... what? The 2009 World Youth Chess Championship is at his halfway point and Australia has 2 players leading their respective events. In the Under 8 Championship Anton Smirnov is tied for first with 5.5/6. In the Under 14 Championship Yi Yuan also has the same score and is sharing first place with IM Core Jorge. Last year I did a post on Zipf's Law, in terms of popularity of chess clubs. But like any good idea/explanation/system it can turn up in other places. In this link from the American Physical Society, there is a discussion on the research done in the area of chess openings. Specifically, the popularity of chess openings. It turns out the popularity of opening moves does follow Zipf's Law with a distribution that seems to mirror the distribution of such diverse subjects such as website popularity, city populations and word usage. The article in the link is only a review of the work btw. Click through to the pdf document for the actual study. Having just finished an article on 1.b4 for Australian Correspondence Chess Quarterly, I've come to the conclusion I'm not a big fan of the opening. 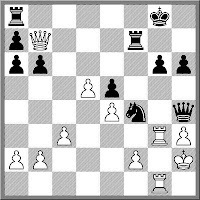 Possibly it is because it is one of the few off-beat openings I haven't tried, but to me White just doesn't get enough out of it. Staking a claim on the queenside is a little premature, given that the centre is yet to be contested. 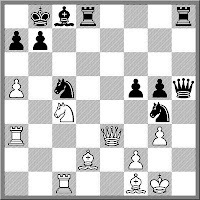 However it does have its devotees so here is a game where White manages to grab more than a fair share of the centre by gambiting two pawns and quickly crushing Black. I suspect that while Kramnik wouldn't be considered a shock winner of this event, not many pundits picked him for first before the event began. However he started the event with a number of fighting games and was rewarded with an early lead which he then maintained throughout. A couple of other players kept pace but then fell back. Second place was shared by 'the good' Ivanchuk and a surging Carlsen, who score his 2 wins in the final 2 rounds. Aronian and Anand tied for 4th but Anand would be dissapointed with his final game (and Aronian delighted) after he was crushed by Aronian in 25 moves. Indeed he was busted by move 15, and the final 10 moves were just the crash in slow motion. Paddy Connell, one of the great characters of the Canberra chess scene in the 1990's passed away early last week. Although he hadn't been involved in chess for the past decade (having found religion), he was still fondly remembered by those who knew him. 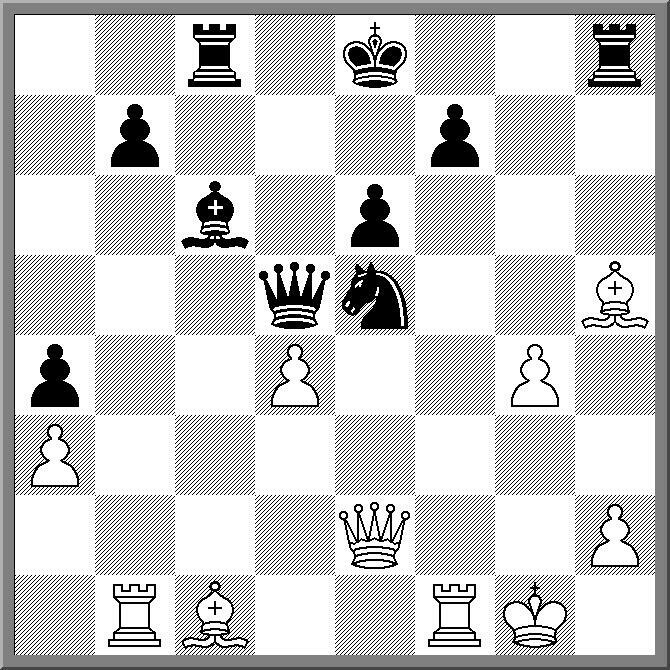 As a player he was a fan of the off-beat opening, and even once played the Irish Gambit (1.e4 e5 2.Nf3 Nc6 3.Nxe5??!) against me. 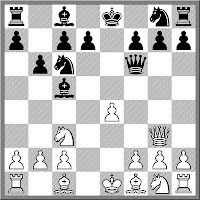 His approach to analysis was simply to let the opponent do it for him ie he would play the move that struck his fancy, and leave it up to the opponent to prove whether it was sound or unsound. Patrick (as he was christened) was also a hard working chess organiser, running Street Chess every Saturday in Canberra for nearly a decade. It was here he showed a passing familiarity with the english language when he introduced a rule which read 'non-aspersive adversarial banter is permitted between consenting equals' (which should simply read 'sledging is allowed'). For those in Canberra who wish to attend the funeral service it is at 10:00 am Monday 16th November at William Cole Funerals, Belconnen. There are all endings we "have to know" ie ones guaranteed to bring home the point (or save the half point). The Lucena Position and the Philidor Position are 2 such examples, and of course there are many more. However I suspect the list of endings I "have to know" might not be as extensive as the endings a 2400 rated player has to know. And once you get into the 2700+ range the list might be both long and increasingly obscure. Of course one of the reasons why club players don't collect as many positions as stronger players is that we aren't forced into as many endings, either due to our games being decided by "the last blunder" or that out opponents play inferior moves in these endings, making our task easier. Such knowledge, and its application, was quite apparent in the round 6 game from the Tal Memorial between Kramnik and Ponomariov. In a R+P v B+P ending, Ponomariov's bishop was defending his pawn and White had to force a zugzwang position to win the pawn. According to the Chessvibes site this was a similar ending to the 1979 Timman v Velimirovic ending fr om the 1979 zonal, and while I have no reason to dispute the additional claim that every Dutch chessplayer now knows how to play this ending, I wonder how many other chess players (apart from Kramnik) are familiar with it as well. 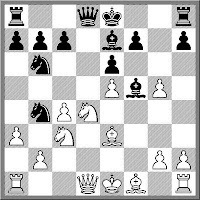 The diagram position is not from this game but from a much older game between Euwe and Hromadka. A similar kind of ending (although White does not have a pawn), there is a right way and a wrong way to play it. In "Training for the Tournament Player" Dvoretsky says "you either know it or you don't"
Didn't quite get yesterdays blog post done in time as I was wrestling with malware on a couple of home computers. So treat this as yesterdays post, and today's will arrive at its usual time. The late Eduard Gufeld was quite a figure on the international chess circuit. Even before the fall of the USSR he travelled quite widely to many western tournaments including the 1988 Doeberl Cup (which he tied for 1st in). It was rumoured however that part of the reason for this travel was as a 'messenger' for the KGB, in that in visiting overseas Russian communities he reminded them of who was watching from within the USSR. The other odd thing about Gufeld is that he seemed to be on the receiving end of a couple of cruel barbs from Tigran Petrosian. 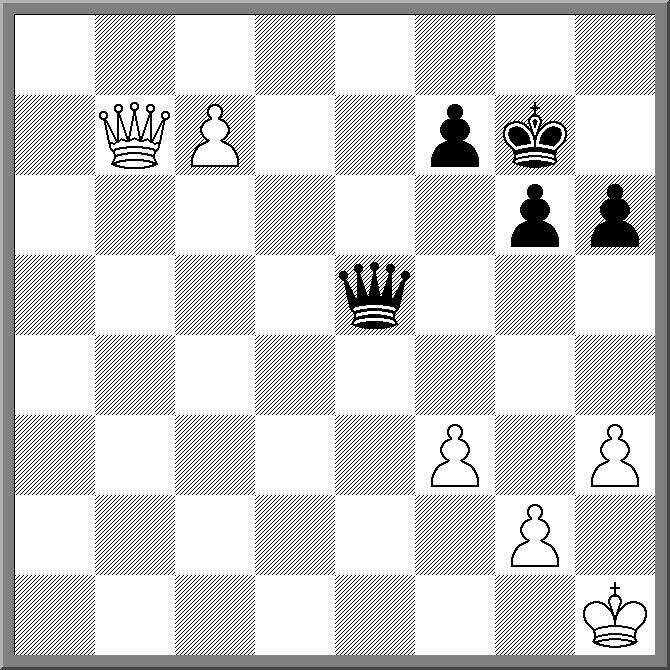 In Dvoretsky and Yusopov's book 'Positional Chess' Dvoretsky describes a joint analysis session between the two. After being constantly outplayed by Petrosian Gufeld asked 'How is it that my position isn't better?'. 'Because my head is better' explained Petrosian. 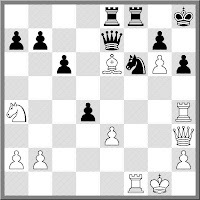 Petrosian delivered an even crueller put down soon after Gufeld became a Grandmaster. Gufeld, not an immodest man I must say, walked up to Petrosian at a tournament and said 'Tigran, now we are equals'. At that moment a journeyman GM walked by (possibly Matulovic) at whom Petrosian pointed and said, 'No. Now you are his equal'. The Isle of Lewis Chessmen is a popular news item, and another article concerning them has appeared on the BBC website. This article reports that there are doubts about the origin of the pieces. Now the problem I've always had with the Lewis Chessmen is that they seem to predate the widespread popularity of chess in Western Europe. They were apparently manufactured during the 12th Century, a time where very little evidence of chess being played has been discovered. Of course far smarter people than me have done far better research on this topic, but I've always suspected that they were more likely to be figurines rather than part of a chess set. Of course, as the article says, they may have been used in another game called Hnefatafl, but the Lewis Hnefatafl-men isn't quite as catchy. Most Transfer Chess (or Bughouse if you insist) is played online, with the Free Internet Chess Server the place to play. Face to face tournaments are much rarer, although I did organise one such tournament about 15 years ago at the Doeberl Cup. Now while the organisers are content to just think of it as a local Canberra event, until I hear otherwise I would like to make two claims. Firstly, it is the biggest open transfer tournament in Australia, and secondly, the winners could make a valid claim to being the Australian OTB Transfer Champions! The ACT Junior Chess League runs an annual Grandmaster Coaching Weekend, which is usually the culmination of the ACTJCL's Development Squad program for the year. For this year, GM Ian Rogers coached 3 groups of leading ACT juniors, alongside local coaches IM Andras Toth, and FM Endre Ambrus. After lunch on the second day, Ian then played a 30 board simul against both the kids he coached, and all the other juniors who took part in the other coaching programs. At the end of 3 hours Ian had managed to score 28 wins, 1 draw (against Michael Kethro) and 1 loss (against Yijun Zhang). Of course the fate of the simul giver is not to be remembered by any of their victories, but only by their losses, so here is the win by Yijun Zhang over Ian Rogers. Broken 'rules' include bringing the queen out early, moving the same piece twice and falling behind in development. So it was understandable that the winning move in this position was to break the rules again, by moving the knight a second time with 7.Nd5! Faced with multiple threats Black tried 7. ... Bxf2+ but it left White a piece up and the win was fairly straightforward. The diagrammed position come from the David Levy book "Play Chess Combinations and Sacrifices" and was set as an exercise for a group of young players I coach. The point of the exercise wasn't to make their heads explode, but to show them that it is possible to calculate 17 or more half moves ahead, as long as you find the correct path. To help them (and yourselves) on their way I gave them a few clues. 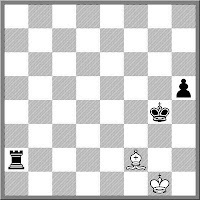 (a) White will checkmate (b) every White move is a check (c) It is a mate in 8 if Black doesn't prolong the game through spite sacrifices. As a group they found the first few moves in about 2 minutes, but then took another 3 or 4 minutes to get the remaining moves in the right order. Can you do better? The strongest tournament of the year, the 2009 Tal Memorial, starts this evening (Australian Time). Actually it as already started as I write this, with the first round match between Carlsen and Kramnik already attracting a lot of interest. There are plenty of places that are providing live coverage but I'll give a plug to two. Chessdom (who I recently mentioned) is providing coverage here. Chessvibes is also providing live coverage with expert commentary at their live games site. However they seem to be a similar system to what Ian Rogers used at the 2009 Oceania Zonal, with the same technical shortcoming of having to refresh your browser to show updates. A note on the site says they are looking into a solution for this. With 8 of the current top 10 taking part, the eventual winner could be anyone. I break my usual habit of picking Peter Svidler, and go with the safe bet of Magnus Carlsen. I'll also be interested in seeing which Vasilly Ivanchuk turns up to the tournament. Keep the 28th and 29th of November free for the 2009 Vikings Weekender. This is the third of the three weekend events in Canberra (Doeberl and ANU being the other 2) and is the most 'community focussed' of the three tournaments. While the Doeberl attracts a big international field, and the ANU usually has a good turn out of titled players, the Vikings Weekender is geared more towards the local Canberra scene. That is not to say interstate visitors are not welcome, but the majority of tournament winners over the years have been local players, often at the expense of out-of-towners. The tournament will be held at the Tuggeranong Vikings Rugby Union Club, Ricardo St, Wanniassa. It will be a single 6 round swiss with a time limit of 60m+10s per move from the start. First prize is a guaranteed $500, and the prize pool is usually above $1000 (depending upon entries). Full details can be found here. I've been cutting back on my online CC lately, as I've decided that it is not helping my chess (too much analysis, not enough decision making). But I received a challenge from a player I felt I couldn't pass up. The aptly named Chessnut* is in the process of trying to play against players from as many countries as possible. He is currently up to country 157 with Papua New Guinea the latest addition to his list. Unfortunately I wasn't the most hospitable opponent, wheeling out the Schliemann Defence to the Ruy Lopez and hacking him in 14 moves. However, I am impressed by his dedication and I hope he makes his target of 200+ countries. *NB This Chessnut is not the same Chessnut who is an Australian chess identity and occasionaly blogs at this link. The website for the 2010 O2C Doeberl Cup is up, with all the details for next years event. The Prize fund for the 3 big tournaments is almost $18,000. The Premier has a first prize of $4000, with a total prize pool of $12,350. The Major (Under 200) has a first prize of $1,500 while the Minor (Under 1600) has a first prize of $750, which is bigger than most Australian weekend events! There have been a few changes this year, especially in the area of time controls (for the Premier) and round times. To bring the tournament in to line with FIDE's new time control for title tournaments, the time control for the Premier is now 40 moves in 90 minutes followed by an additional 30 minutes, with 30 seconds added for each move from move 1. This is the same as the time control for the Olympiad and either allows players extra time to play their endings, or simply provides time for a toilet break. The time controls for the Major and Minor will remain at 90m+30s per move. Due to the slightly longer time controls for the Premier, the playing sessions now begin 6 hours apart (ie 1pm and 7pm on the first 2 days, and 9:30am and 3:30pm for the rest). The Lightning tournament also returns this year. As in previous years each of these events has a maximum entry of 80 players, so if you wish to guarantee a spot in your preferred tournament you need to enter early. Just click on the 'Register' link on the web page. I was planning to say no more about the World Chess Federation, but Stan Vaughan is just the gift that keeps on giving. Following the adage that any publicity is good publicity, I keep getting press releases from the organisation, despite the mocking tone of my previous posts about them. Actually a large number of chess journalists and bloggers seem to be on their 'drop list', but I may one of the very few that use the information they send. The latest missive from the World Chess Federation concerns their press conference to promote the upcoming $7.5 million world championship match. The absolute highlight (for me anyway) was the revelation that Kirsan Ilyumzhinov is an evil spirit who came through a portal that was created by Viktor Korchnoi when he played a match against the long deceased Geza Maroczy. Certainly an interesting theory, although conventional wisdom is that the moves of Maroczy (relayed by a spiritual medium) came not so much from the great beyond, but from a silicon brain. There is even a video of the press conference. Click on this link if you wish to see the faces behind the madness.